I refer to “CPF system will evolve to meet changing needs: DPM Tharman” and “CPF under review to better buffer against inflation: Manpower Minister”. Both ministers were speaking at a CPF forum organised by IPS on 22 July. Recall we had “Our Singapore Conversation” 2 years ago where, strangely, CPF was a non issue. Now that a ‘CPF’ forum has been organised, the more important issues such as transparency and the need to consult members on their needs are ignored. The government should not forget it needs to return CPF monies to their rightful owners because it is a flawed policy. DPM Tharman cleverly deflected the issue to one of “taking higher risks to earn higher income from investing their CPF monies”. GIC’s opacity does not seem to be a concern to DPM Tharman. – If GIC has indeed performed remarkably well, achieving a 20-year TSR of 6.5% in USD, why are CPF members not allowed to invest directly in GIC? – Why should Tharman even need to talk about investing in private pension plans when GIC is an established fund manager with a proven track record? With CPF members invested directly in GIC, there will be full transparency. Is GIC afraid of this? Tharman also said that “CPF system has served Singaporeans well” and “it is to keep the basic strengths of the CPF system”. – If CPF has served Singaporeans well, then why are there huge shortfalls in our retirement savings? – Why are there hundreds of thousands of Singaporeans who are unable to meet the Minimum Sum to afford a basic standard of living? The fact is there are inherent weaknesses in the multi-purpose CPF system and that’s the reason for the current parliamentary debate. CPF’s inherent weaknesses are not its “basic strengths”. DPM Tharman says “GIC manages a pool of assets irrespective of the sources of funds”. There are only 2 sources of funds ie CPF monies and (real) government reserves (land sales proceeds, budget surplus). There is no logic in Tharman’s explanation because CPF monies do not belong to the government, they are not Singapore’s reserves. One has to question the intent of the government for co mingling the funds and causing confusion. As for Minister Tan Chuan Jin, he attempted to appease CPF members by saying the government “is looking at how it calculates the CPF Minimum Sum (MS) figure”. It’s good the government has woken up to its flawed calculation which should have been obvious years ago. Step 1 – Increase the absolute amount from $80000 in 2003 to $120000 in 2015. This has already factored in a 50% inflation over 12 years (4% per year). The government was aware there would be outrage if it had stated the MS amount will double in 12 years. The “in 2003 dollars” double inflation trick seemed to have worked for a while but has now backfired. 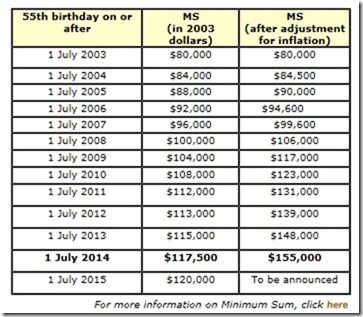 The MS increase is not limited to the OA; the MA has also increased from $25000 in 2003 to presently $$43,500. Within 12 years, CPF MA increased by a whopping 74%! Tan Chuan Jin then engaged in fear mongering tactics by highlighting the issue of citizens living longer in future. Pertinent questions citizens are asking: Why does the government see retirees as a liability to the country after all our contributions? Where is the government’s role in taking care of the elderly? Why does the government continue to force the elderly without income to fend for themselves? Tan says: “So when we talk about shifting goal posts, I would say it is actually not about shifting goal posts”. From delaying the withdrawal of all CPF monies at 55 to 65 to returning a very small regular percentage monthly till we expire is not shifting goal posts? Tan is clearly sleeping as thePAP shifted the goal posts years ago – outside the stadium. Ministers Tharman and Tan are basically saying the need to maintain a broken system with band aid when CPF needs attention in the ICU. If they still do not understand our concerns, I would strongly suggest they read “TOC Policy Exchange on CPF – rethinking the system”. The discussion was attended by members of opposition parties whose views resonate with CPF members. Important concerns of CPF members have been glossed over by PAP politicians. Fortunately they were highlighted by opposition political party members at the TOC Policy Exchange on CPF. The PAP should no longer skirt the transparency issue as stakeholders demand and deserve answers. GIC must disclose all investments with CPF monies. The PAP only wants to address CPF members’ concerns with tweaks. It should be mindful that this will only sow more distrust. This article first appeared on likedatosocanmeh.